As we begin preparing for construction, there are many things that must to come together along the way to make this a successful project. As we may have mentioned before, we love to keep you not only informed, but educated on the processes it takes to build a UNIQUE swimming pool, spa, and landscape project. We invite you to be as involved as you see fit or have time to be, or you can sit back and let UNIQUE do what we do best. The pool construction process can vary based on the type of project we are undertaking, the scope of work, and whether we are integrating the landscape and other features into your project. A typical pool can easily be finished in 30 to 40 days, but with integration of landscape, general contracting, and underground projects, the time line can extend to 60 to 90 days. The first step after signing a contract is working on engineering, blue-staking and permits for your project. This process can take anywhere from 7 to 21 days and actually more in certain jurisdictions. Once your project is reviewed by the city or county and the necessary permits are obtained, we will contact you to setup a time to have our first onsite “construction meeting”. This meeting allows us to meet with you and review your project onsite. 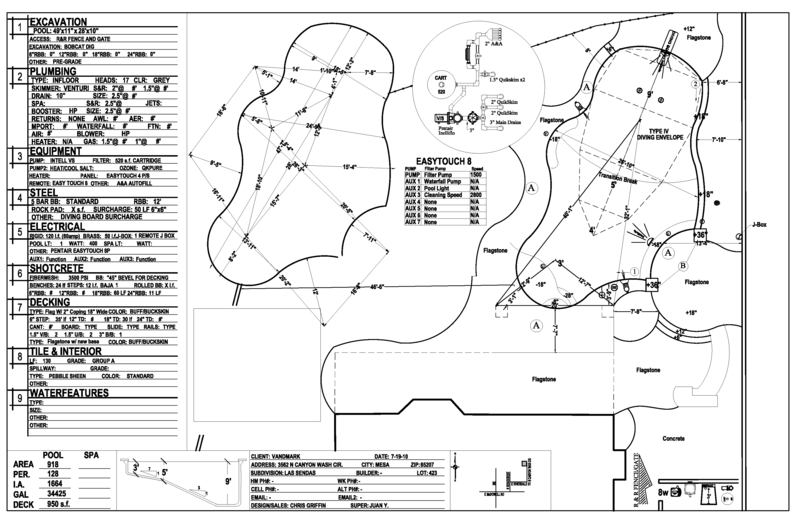 At this time we will be discussing many of the layout and construction aspects of your job. At this meeting we will “LAYOUT” the swimming pool which you may notice is one of the first steps required to building a pool and spa. Once the pool layout is approved by you, we are ready to move forward with the excavation phase.